A growing number of Eurocrats allegedly oppose David Cameron’s demand for EU treaty renegotiation, as they're fearful of a quiet democratic revolution born of EU citizens’ will to protect the sovereignty of national parliaments. Anger erupted among Conservatives on Wednesday after European Commission President Jean-Claude Juncker said changes to the European Union’s treaty could not be made until after 2019. The move was orchestrated in a bid to avoid pushing the EU into drawn-out negotiations where nation-states hold the power to veto agreements. Because the date outlined by Juncker falls two years after the 2017 in/out referendum pledged by the Tories, the EC President’s position has been condemned by Euroskeptic Conservatives. Jacob Rees-Mogg, the Conservative candidate for North East Somerset, said Juncker did not have the authority to make such resounding decisions on EU constitutional law. “Treaty change is entirely a matter for the member states using the Commission as a secretariat,” he told the Times. “It is not for him to decide when treaty change takes place,” he said. 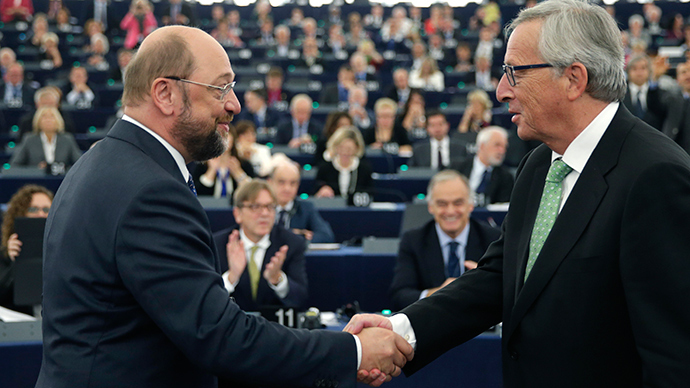 Martin Schulz, the president of the European Parliament (EP), backed Juncker’s view, warning a treaty change is too dangerous in the EU’s current political climate. Speaking in Brussels on Wednesday, Schulz said the Parliament has “warned of the dangers of treaty change” from the outset. Schulz and Juncker’s remarks will come as a setback to Cameron, who had planned to use eurozone fiscal reforms as a vehicle for rewriting the terms of Britain’s EU membership. Juncker has discussed the contentious issue at various Brussels-based summits with EU leaders and thinks the majority of them wish to avoid triggering similar EU membership referendums in other European states. In particular, concerns have been raised about France and Holland, where Euroskepticism and opposition to the euro is particularly pronounced. As the eurozone’s fiscal and economic crises prevail, faith in the European project remains at a low ebb. Once perceived as a distinctly British school of thought, Euroskepticism has rapidly spread across the continent. Following fiscal reforms and demands issued by the European Central Bank (ECB), critics warn Eurocrats have trampled upon the sovereignty of nation states. To an increasing number of citizens, the EU has begun to function like a political straightjacket that is eroding national politics, social democracy and the welfare state. As Britain’s general election campaign race continues, arguments for and against the UK’s EU membership have been widely circulated. Pro Europa, a think tank which advocates for Britain to remain a part of the EU, says leaving the union would have grave implications for British jobs, trade, the environment, and the state’s democratic foundations. The think tank’s stance is echoed by Open Europe, which also campaigns against a Brexit. An Open Europe report, published last month, said Britain’s exit from the EU could spawn severe economic hardship, unless UK migration levels remain steadfast. The report argued that a Brexit could spur a huge loss of trade, and Britain’s reliance on European migrant workers could cost the UK economy up to £56 billion a year (2.2 percent of its GDP). By contrast, the militantly Euroskeptic Bruges Group argues EU bureaucracy has “interfered extensively” in the management of UK financial institutions. The pressure group maintains the City of London is currently in “retreat,” with “excessive and unfriendly EU regulation” being primarily to blame. A regulatory shift from UK to EU institutions is ongoing, as a direct result of Europe’s Lisbon Treaty, it argued. Juncker’s remarks on delaying all possibility of a change to the EU’s constitution have undermined the Conservative Party’s election campaign strategy, which focuses on a pledge of renegotiating Britain’s relationship with the EU and holding a referendum on the nation’s EU membership in 2017. Nevertheless, the possibility of such a constitutional shift has not been ruled out. If Cameron is elected PM for a second term, he requires the backing of 14 other EU leaders to demand negotiations on an EU constitutional shift. In such a scenario, each state would hold the power to veto proposed agreements.